“Honor the land. Honor the vines. Honor the goddess within you.” It is early Saturday morning and Tracy Chamoun is teaching her weekly yoga class at Chateau Belle-Vue. “Soften your hips. Soften your shoulders. Soften your face,” she continues and smiles into the room full of women who drove up from Beirut to be here. In Bhamdoun, surrounded by Belle-Vue’s vineyards, you may only be half an hour away from the capital but it feels like it’s worlds away. I first came across Chateau Belle-Vue last December. Racing around town to get my Christmas shopping done, I stopped at a wine shop in Saifi village to buy some bottles for visiting foreign colleagues. I figured a good red wine would be a special way for them and their families to have a taste of Lebanon at their Swedish Christmas tables. The friendly shopkeeper told me they only sell two Lebanese wines because of their outstanding quality. Though I wasn’t familiar with it, I was easily convinced that Chateau Belle-Vue was the one to choose and a few minutes later, I was back in the car with four bottles of Le Chateau — $50 each. One of these attractive bottles was for me and later that week, my friend and I first tasted the terroir of Bhamdoun. Situated in the former summer estate of the French ambassador to Iraq and Syria, the French government put the property up for sale in the late 1990s. 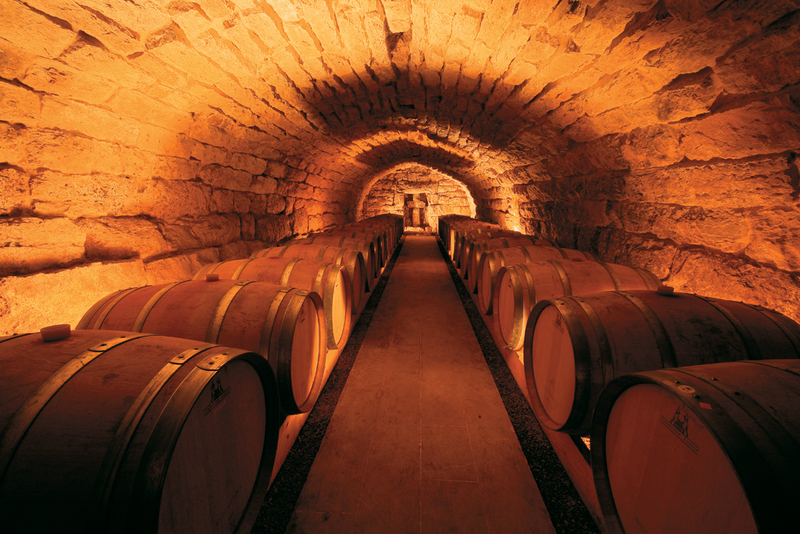 Partly destroyed by the Civil War as it raged through Bhamdoun for many years, presented the French with an appealing bid: to rebuild the land as a winery. 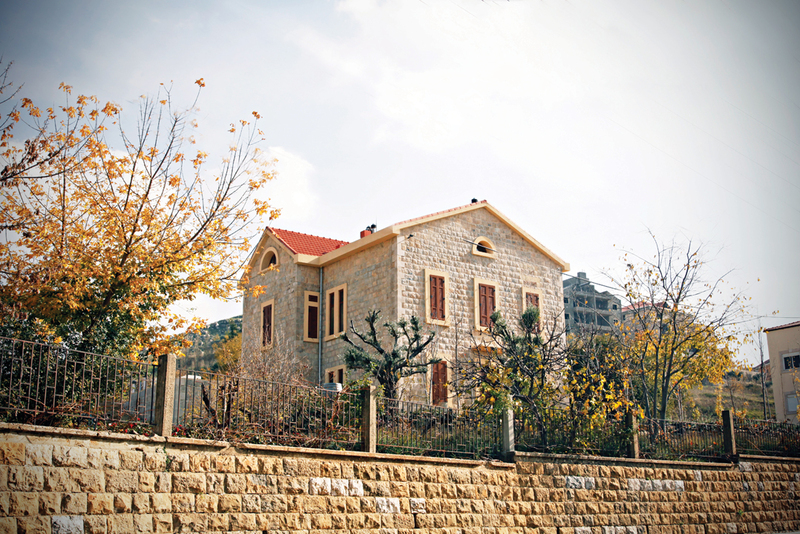 The couple’s attraction to Bhamdoun is rooted in Naji’s childhood. He grew up in a hotel wing of Bhamdoun’s famous Belle-Vue, which was owned by his maternal grandparents. When war came to the village, they all had to flee and the only thing Jill recovered years later, among the rubble of the once thriving hotel, was a single tile; the rest of the property was looted and destroyed. She framed it for Naji as a memory of the place. 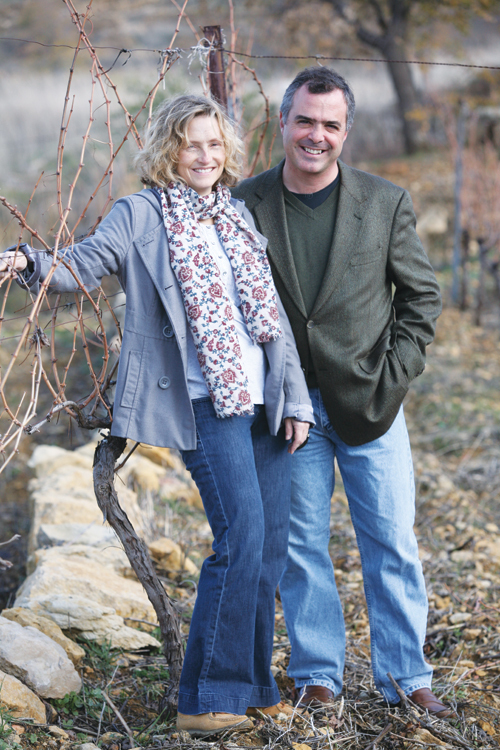 And 15 years ago, in another homage to Belle-Vue, one of the first things Naji and Jill did was to plant old vines in its front yard. They worked with Vivaldi’s Four Seasons blaring out of the windows of the car; this was the start of their emotional project. Originally from Minnesota, Jill met her Lebanese husband at college and now seems to love Lebanon and Bhamdoun with a passion many Lebanese can’t match. She takes me on a tour of the vineyard. While they only started with three plots, they now harvest over a hundred. The vineyard has stunning vistas. 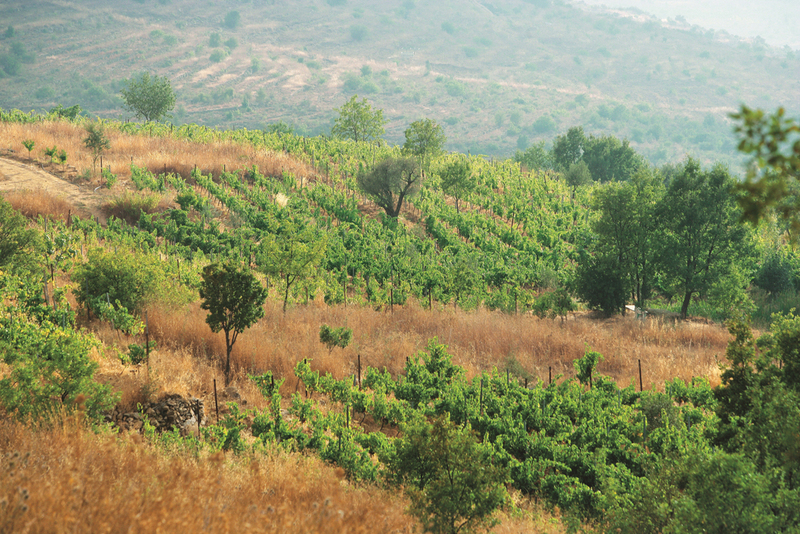 Because of the altitude of Bhamdoun, the grapes harvested are small, the size of chickpeas. The skin of the grape thickens in an effort to protect the pulp from the light and this thicker than average skin results in a deeper color and an increase in tannins. Winemakers know that this kind of terroir is unique. The fruit is also distinct because of the micro-climates of the valley. Grapes have always done well here, their greatest fortune is that there is no fog and no rain in the summer — vines need to suffer to mature properly and that’s what they get here; they aren’t even irrigated. The area also boasts two kinds of soil, with divergent levels of clay and limestone, which makes for a very different grape, and in effect, a different wine. That’s why, though Belle-Vue makes a Bordeaux style blend, it isn’t that obvious. I don’t remember drinking anything similar in Lebanon before. The intense red color of the wine may already be a hint to the surprising bouquet that awaits you when you take your first sip of Le Chateau. The well rounded, opulent taste, it seems to me, cannot be matched by a milder Bordeaux. Even the limited edition of their white wine is moulded by an amazing range of aromas, from passion fruit to peaches, carrying the sharp freshness of summer. But there’s more to Belle-Vue than making wine. New olive and fig trees are planted continuously to support a green and fertile valley since Naji and Jill’s mission is to ‘give back’ after so many years of neglect. With many of the employees coming from the village (every grape is handpicked) and the renting of farmland from locals, this is a project deeply embedded in the community in which it is situated. During my tour, I also realize how Jill has this way of making you feel at home, perhaps due to the passion and connection she has to the land. She explains it all more like a hobby that got a bit out of hand, not a money making project: “Naji works in finance, this won’t put our four kids through school,” she laughs as we look over the Mediterranean from the vineyard. The core team at Chateau Belle-Vue is female. Esperanza Geara, the vineyard manager, came from Spain with many years of international experience and Diana Salame, the consultant winemaker, is the brain behind the elegant taste. They produce around 20,000 bottles per year, two reds, La Renaissance and Le Chateau, and Petit Geste, their white, as well as some arak. Every effort is made to make this a balanced, organic wine label. “We feel this kind of wine is like romance,” Jill says over lunch in their cozy restaurant, Le Telegraphe, where the Franco–Italian menu is matched to the wines. The cindered creamy camembert cheese, prepared in the fireplace and combined with their red wine, makes me want to drive to Bhamdoun every day. While the restaurant has been running for two years, the hotel next door only opened late last year. The building had been totally destroyed, with no roof or windows and the plumbing was ripped out, so it required some serious renovation work. Today, this former French ambassador’s summer house is a charming boutique hotel with seven rooms, named after the different grapes they harvest. As you can probably imagine, the rooms, replete with fireplaces, are homey down to the last detail, and Jill makes sure there’s a jar of freshly baked cookies in every room. This is a boutique winery with a lot of character. Its small size has, undoubtedly, something to do with its high caliber and the variety of awards they’ve already won — their Cabernet Sauvignon and Merlot blend won gold at the London International Wine and Spirit Competition for instance. With their intimate, organic approach and all round hospitality to match the fantastic wine, the small scale translates to great impact. I know that the next time I open a bottle of Belle-Vue, it will be like I’m at the Chateau again, overlooking a stunning mountain landscape of verdant valleys.